On the second floor of Hampton Hall, a museum-quality exhibit transports visitors to another realm -- the El Aguila Mine near Oaxaca, Mexico. The mining exhibit occupies a short hallway and two adjacent walls, and it has all the interactive and multimedia trappings of a top-notch museum display. Four touch screens display educational videos and offer games based on the exhibit's facts. Photos, display boards and bright graphics present information in easy-to-understand chunks. Samples of bedrock, safety equipment, raw minerals and other items taken from the mine are displayed under Plexiglas, and the hallway's facade is even decorated to look like a mining tunnel. The exhibit's purpose is to educate Purdue students and visiting youngsters about mining, says Steven Smith, K-12 coordinator for the Department of Earth, Atmospheric, and Planetary Sciences (EAPS). The industry is infrequently discussed in science curricula, but its jobs are open to many with EAPS degrees. "Part of the goal with this exhibit is to shed light on one of the unique ways alumni can put their EAPS degrees to work," Smith says. 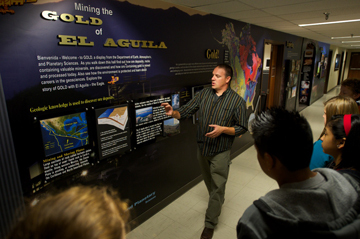 "Mining might not seem very accessible to most students, but this exhibit proves that, with the right degree, anyone can enter that or any other related industry if they simply have the desire." The funds to build the mining exhibit came from Bill Reid, chief executive officer of Gold Resource Corp., based in Colorado Springs, Colo. The company owns El Aguila Mine, and Reid is an EAPS alumnus and an Indiana native. El Aguila Mine gathers and refines several kinds of ore, including copper, gold, tin and silver. Last year, Reid and three EAPS faculty and staff traveled to southwestern Mexico to gather pictures, data, rock samples and other items from the mine for the exhibit. The resulting exhibit presents information chronologically. Its first display presents geological facts about the formation of ore, including plate-tectonic and volcanic activity. The exhibit then discusses mining safety, mining techniques, information about processing ore, efforts to sustain the environment, and careers in mining and other fields related to geoscience. The exhibit's high quality can be attributed to the Agricultural Communication's Exhibit Design Center, which put it together, Smith says. In addition to the Purdue students who look at the exhibit daily, middle school classes, local Boy Scout troops and other groups frequent it. Eventually, EAPS officials hope to create a mobile mining display that would tour museums nationwide. For now, though, steps are underway to make the second floor of Hampton Hall even more inviting and educational. Soon, a mineral display and a geologic timescale of the earth will go up near the mining exhibit, Smith says. "We want all students to be excited about coming here, and we're hoping these displays will spark kids' curiosity," Smith says. "If we can do that -- if we can inspire them to be scientists -- that's the goal."